Not to be confused with Chernihiv. "Cernăuți" redirects here. For the former administrative subdivision of Romania, see Cernăuți County. This article is about the Ukrainian city. For the Israeli writer, see Yemima Avidar-Tchernovitz. The Chernivtsi City Municipality (center) on the map of Chernivtsi Oblast. Chernivtsi is currently viewed as one of Western Ukraine's main cultural centers. The city is also considered one of Ukraine's important educational and architectural sites. Historically a cosmopolitan community, Chernivtsi was once dubbed "Little Vienna" and "Jerusalem upon the Prut". Chernivtsi is currently twinned with seven other cities around the world. The city is a major regional rail and road transportation hub, also housing an international airport. Aside from its Ukrainian name of Chernivtsi, the city is also known by several different names in various languages, which still are used by the respective population groups much as they used to be throughout the city's history, either in connection with the rule by one country or another or independently from it: Romanian: Cernăuți; German: Czernowitz; Polish: Czerniowce; Hungarian: Csernovic, Russian: Черновцы́, translit. Chernovtsy (until 1944: Чернови́цы, translit. Chernovitsy). In the times of Halych-Volyn Principality the city's name was Chern. A fortified settlement located on the left (north-eastern) shore of the Prut dates back to the time of the Principality of Halych and is thought to have been built by Grand Prince Yaroslav Osmomysl. Legendary accounts refer to this fortress-city as Chern', or Black city; it is said to owe its name to the black color of the city walls, built from dark oak layered with local black-colored soil. This early stronghold was destroyed during the Mongol invasion of Europe by Boroldai in 1259. However, the remaining ramparts of the fortress were still used for defense purposes; in the 17th century they were augmented with several bastions, one of which is still extant. 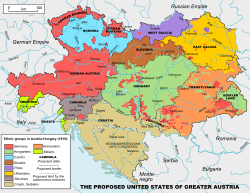 Map of the United States of Greater Austria, proposed in 1906, shows the city at the border of the areas inhabited by Romanians and Ukrainians. Between 1359 and 1775, the city and its surroundings were part of the Principality of Moldavia, one of the historic provinces of Romania; the city being the administrative center of the homonymous ținut (county). The name Cernăuți/Chernivtsi is first attested in a document by Alexandru cel Bun (Alexander the Good) on 8 October 1408. In Ottoman sources, the city was mentioned as "Çernovi", a phonetic transliteration of a Latin cognomen meaning new castle see French Castelnau or Welsh Carno. In 1775, the northwestern part of the territory of Moldavia was annexed by the Habsburg Empire; this region became known as Bukovina. The city became the region's capital, which in 1849 was raised in status and became known as the Duchy of Bukovina, a crownland of the Austrian Empire. The city received Magdeburg rights. The city began to flourish in 1778 when Knight Karl von Enzenberg was appointed the chief of the Military Administration. He invited many merchants, craftsmen and entrepreneurs to help develop trade and other businesses. Saint Peter's Fairs ( 1–15 July) had given a new vibrant impulse to the market development from 1786. In the late 19th century the German language—due to the Habsburg and the very important Jewish influence—became the lingua franca and more and more newspapers were edited in German, also a remarkable literary production in German began in this period, featuring most prominently Karl Emil Franzos. Since 1991, Chernitvtsi has been a part of independent Ukraine. In May 1999, Romania opened a consulate general in the city. Contemporary Chernivtsi is an important regional center, which is situated on the picturesque banks of the Prut River and occupies an area of about 150 square kilometres (58 sq mi). In April 2016, amidst the Ukraine crisis, the Chernitvtsi city council banned the use of the word "Russia" on signboards, advertisements, billboards, tables and other public boards. Chernivtsi is located in the historic region of Bukovina, which is currently shared between Romania (south) and Ukraine (north). The city lies 248 meters above sea level, and is surrounded by forests and fields. The River Prut runs through the city's landscape. Chernivtsi is the administrative center of the Chernivtsi Oblast (province) and the city itself has own government within the oblast under direct subordination to oblast. Armenian church in the early 1900s. An early 20th-century postcard depicting the Czernowitz Synagogue. According to the latest All-Ukrainian population census in 2001, the population of Chernivtsi was approximately 240,600 people of 65 nationalities. Among them, 189,000 (79.8%) are Ukrainians; 26,700 (11.3%) Russians; 10,500 (4.4%) Romanians; 3,800 (1.6%) Moldovans; 1,400 (0.6%) Polish; 1,300 (0.6%) Jews; 2,900 (1.2%) other nationalities. Based on the last available Soviet data, the population of the city, as of 1 January 1989, was approximately 295,000 residents. Among these, there are some 172,000 Ukrainians, 46,000 Russians, 16,000 Romanians, 13,000 Moldovans, 7,000 Poles and others. The Romanian population in Chernivtsi started decreasing rapidly after 1950. Many Romanians fled to Romania or were deported to Siberia (where most of them died), and the remaining Romanian population quickly became a minority and assimilated with the majority. Nowadays, the Romanian minority in Chernivtsi is still decreasing as a result of cultural assimilation and emigration to Romania. Chernivtsi once had a Jewish community of over 50,000, less than a third of whom survived World War II. Romanian lawyer and reserve officer Theodor Criveanu, as well as the then city mayor Traian Popovici, supported by General Vasile Ionescu saved 19,689 Jewish people. Initially, Governor of Bukovina Corneliu Calotescu allowed only 190 Jewish people to stay, but Traian Popovici, after an incredible effort, obtained from the then dictator of Romania Marshal Ion Antonescu an allowance of 20,000. After World War II, the city was a key node in the Berihah network, which helped Jews to emigrate to the then Mandate Palestine from the difficult conditions after the War. Following the collapse of the Soviet Union in 1991, the majority of the remaining Jewish population emigrated to Israel and the United States. A famous member of this latter emigration is the actress Mila Kunis. Chernivtsi was inhabited by Ukrainians, Romanians, Poles, Ruthenians, Jews, Roma, and Germans. During its affiliation with the Austro-Hungarian monarchy, Chernivtsi enjoyed prosperity and culture as the capital of the Bukovina crown land. After World War II, the Shoah and Porajmos, and the resettlement and expulsion of the whole ethnic groups, including Germans and Romanians, this status was diminished. Today, the Ukrainians are the dominant population group. Chernivtsi's change in demographic diversity is demonstrated by the following population statistics. Once, Romanians and Ukrainians formed the majority of the population. However, after 1870, Yiddish- or German-speaking Jews surpassed the Romanians as the largest population group of the town. After 1880, the Ukrainians surpassed the Romanians as the second largest population group. There are many places which attract citizens of Chernivtsi and the visitors: Drama Theatre, Regional Philharmonic Society, Organ and Chamber Music Hall, puppet-theatre, Museum of Local Lore, History and Economy, Museum of Fine Arts, Bukovynian Diaspora Museum, Museum of Folk Architecture and Way of Life, memorial museums of writers, the Central Palace of Culture, the Star Alley in Teatralna Square. The city of Chernivtsi has a lot of architecturally important buildings. Many historic buildings have been preserved, especially within the city's center. However, after years of disrepair and neglect, the buildings are in need of major restoration. As Chernivtsi was part of the Austro-Hungarian Empire, it was closely related to the empire's culture, including architecture. Main architectural styles present within the city include Vienna Secession and Neoclassicism, Baroque, late Gothic architecture, and fragments of traditional Moldavian and Hungarian architecture, Byzantine architecture as well as Cubism. During the Interwar Romanian administration, a great number of buildings in the Neo-Romanian and Art Deco architectural styles were also built.The city is sometimes dubbed Little Vienna, because its architecture is reminiscent of the Austro-Hungarian capital Vienna. The main architectural attractions of the city include: the Chernivtsi Drama Theater (1905); the Chernivtsi University—UNESCO World Heritage Site (1882); the Regional Museum of Fine Arts—the former savings bank (1900); the Regional Council—former Palace of Justice (1906); and the Chernivtsi Palace of Culture—former Jewish National House (1908); among many others. The magnificent Moorish Revival Czernowitz Synagogue was heavily damaged by fire in 1941, the walls were used to create the "Chernivtsi" movie theater. The Czech architect Josef Hlávka designed, in 1864–1882, the buildings that currently house the Chernivtsi State University. They were originally the residence of the Bukovinian and Dalmatian Metropolitans. The Romanesque and Byzantine architecture is embellished with motifs of Ukrainian folk art; for example, the tile roof patterns duplicate the geometric designs of traditional Ukrainian embroidery. The history of Polish community in Chernivtsi dates back to the late 18th century, when authorities of the Habsburg Empire encouraged Poles to move to Bucovina. By mid-19th century, several Polish organizations existed in the city, including Bratnia Pomoc and Czytelnia Polska. On initiative of publishers of the Gazeta Polska daily newspaper, collection of money for the construction of Polish House was initiated. In early 20th century, two Polish activists, doctor Tadeusz Mischke and judge Jakub Simonowicz purchased a house. In 1904, its expansion was initiated. It was carried out by architect Franciszek Skowron, interior decorator Konrad Górecki and sculptors from Zakopane, Skwarnicki and Gerasimowicz. The expansion was completed in 1905, and Polish House operated until World War II. In 1945, Soviet authorities opened here a cinema, later a music school. Currently, the complex houses Adam Mickiewicz Association of Polish Culture. Apart from Polish House, Chernivtsi also has German, Romanian and Jewish Houses. The most popular kinds of sports in Chernivtsi include archery, judo, field hockey, karate, power-lifting and orienteering. Chernivtsi's baseball, hockey, and football clubs (FC Bukovyna Chernivtsi) are participants of the Ukrainian national championships. Chernivtsi has a large number of sports establishments and facilities, including 5 stadiums, 186 sports grounds, 2 tennis courts, 11 football fields, 5 skating rinks, 21 shooting galleries, 3 swimming pools, 69 gyms, 62 gyms with special training equipment and an international motorcycle racing track. Over 7,950 inhabitants are members of sport clubs within the city, and more than 50,000 people participate in various sport activities. Currently, 8 sportsmen from the city are the members of national teams and 12 are members of national youth teams. 3 athletes from Chernivtsi were prize-winners in various world tournaments, 2 were winners of European and 42 of national championships in 2002. Chernivtsi has been host to the Sidecross World Championship a number of times, most recently in June 2010. There is Chernivtsi railway station, 38 Gagarina Street. Chernivtsi is served by the Chernivtsi International Airport (CWC) located south of the city centre. In February 2016 the Chernivtsi city council terminated its twinned relations with the Russian cities Bryansk and Podolsk due to the Ukrainian crisis. Inna Tsymbalyuk (born 1985), Ukrainian model and actress; semifinalist at Miss Universe 2006. ^ a b c Zhytariuk, Natalia. "Bukovyna Week in Austria". Den. Retrieved 26 September 2007. ^ a b c "Bukovina. The beech tree land". Ukraine Cognita. Archived from the original on 28 July 2011. Retrieved 26 September 2007. ^ "Trypillya – a culture that was contemporaneous with Ancient Egypt and Mesopotamia". Welcome to Ukraine. Retrieved 27 September 2007. ^ "City of Chernivtsi – History". The Komkon Site. Archived from the original on 27 September 2007. Retrieved 25 September 2007. ^ a b c d "History". Chernivtsi City Official Site. Retrieved 25 September 2007. ^ "Chernivtsi". Ukrainian heraldry. Retrieved 25 September 2007. ^ a b "Bukovina". Encyclopædia Britannica. Retrieved 26 September 2007. ^ "Pogoda.ru.net" (in Russian). Weather and Climate (Погода и климат). May 2011. Retrieved 28 November 2015. ^ "CERNOVCY Climate Normals 1961–1990". National Oceanic and Atmospheric Administration. Retrieved 17 December 2012. ^ "Righteous Among the Nations Ceremony from Romania Tomorrow". Yad Vashem. Archived from the original on 16 November 2008. Retrieved 21 April 2009. ^ "Sport & Tourism II". Chernivtsi City Official Site. Retrieved 25 September 2007. ^ a b c d e "Sport & Tourism". Chernivtsi City Official Site. Retrieved 25 September 2007. ^ "Podolsk sister cities". Translate.google.com. Retrieved 29 April 2010. Wikivoyage has a travel guide for Chernivtsi. Wikimedia Commons has media related to Chernivtsi. Look up chernivtsi in Wiktionary, the free dictionary. Wikisource has the text of the 1905 New International Encyclopedia article Czernowitz. "Main Page". Chernivtsi City Official Site/English. Retrieved 12 April 2010. "Main Page". Chernivtsi City Official Site/English(mirror). Retrieved 12 December 2009.